Gian Lorenzo Bernini's bust of Roberto Bellarmino, on exhibiation at the Fairfield University Art Museum through May 19, 2018. FAIRFIELD — Except on one occasion, when it traveled briefly to an adjacent building, Gian Lorenzo Bernini’s bust of the 16th century Italian Jesuit priest Roberto Bellarmino has for nearly 400 years sat aloft and out of sight in a niche, well above the high altar in the Church of the Gesu, in Rome. “It’s never, ever left Rome. It will never, ever leave again. And people for three months here will have an occasion to come look it in the eye and stand a foot away from this great early masterpiece by one of the greatest artists in the history of time,” the Art Museum’s Director and Chief Curator Linda Wolk-Simon, said on Monday, hours before the bust and other works from the exhibition, which opens Feb. 2, were to arrive. 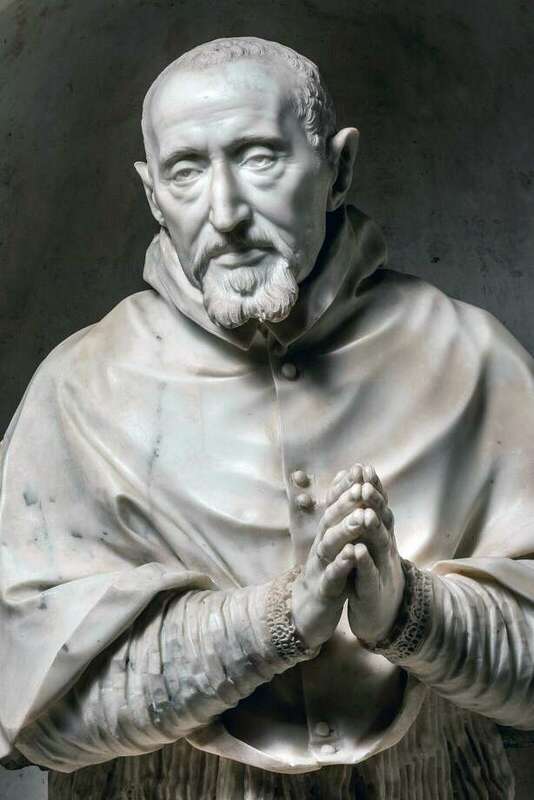 The alabaster Bernini bust of Fairfield University’s patron saint, for whom the school’s Bellarmine Hall was named, will be joined by four other items from the Church of the Gesu. Featured will be a painted wood model of the church’s apse by the Bernini disciple Giovanni Battista Gaulli who painted the Gesu’s enormous ceiling fresco over the course of 20 years. An altar sculpture by the artist Ciro Ferri, a cartegloria from the altar of St. Ignatius, and a silk chasuble that once belonged to the church’s benefactor, Cardinal Alessandro Farnese, with images of the Virgin Mary depicted in gold and silver thread, were also carefully transported. Other works transported from more than 15 American universities, museums and private collectors, with the pieces from the Church of the Gesu, tell the early story of the Society of Jesus, which was founded in 1540 by St. Ignatius of Loyola and six other academics who returned to Rome after studying at the University of Paris. At the time, the Catholic Church had recently lost a significant segment of its population in northern Europe after Martin Luther’s 95 Theses, in 1517, catalyzed the Protestant Reformation. The invasion of Italy in 1527 by troops loyal to the Holy Roman Emperor Charles V that left Rome in ruins and the growing Turkish Muslim threat from the east further threatened the Papal stronghold. Cardinal Alessandro Farnese, a grandson of Pope Paul III, championed the Jesuits and funded the construction of the church in 1568 for the order, who in their early years had few resources. “They were a new religious order and had no churches, so they began to build, basically in the Renaissance style. And they had to get important patrons to pay,” said Father John O’Malley, a historian, professor of theology at Georgetown University and member of the committee at Fairfield University that planned the exhibition. “Aside from St. Peters in Rome, it was the most important church building in the 16th century and had a great influence in Catholicism — but also outside Catholicism,” O’Malley said. O’Malley was part of the group, including Wolk-Simon and Xavier Salomon, chief curator at the Frick Collection, who conceived of the ambitious exhibition more than two years ago. It was Salomon who first suggested that Fairfield try for the bust of Bellarmino, despite Wolk-Simon’s skepticism. “It’s Bernini, who’s the greatest artist of the 17th century, and one of the most important sculptors of all time. And that work had never before left Rome. And this museum is new and tiny and no one in Connecticut, let alone Italy, has even heard of it. I thought, ‘It’s just not going to happen!’” Wolk-Simon said. Nevertheless, Wolk-Simon reached out to Italy, earning approval from the rector of the Church of the Gesu, the Italian Ministry of Culture and the Superior General of the Society of Jesus -- the order’s top-ranking official. “That’s like asking the Pope, ‘Can you please say yes, I can borrow Michelangelo’s Pieta?’” Wolk-Simon joked. The request was at first met with apprehension, but at length, “the no turned to a maybe, to a probably, to an ‘absolutely.’ And it wasn’t just the Bernini, it was three other great things I had asked for. And then the rector added a fifth to the mix,” Wolk-Simon recalled. At the same time, Wolk-Simon was working to secure loans from places like the Los Angeles County Museum of Art, the Museum of Fine Arts, Houston, Princeton University and Yale University, ultimately reaching deals with all but one of her targets and making possible the hugely ambitious exhibition.